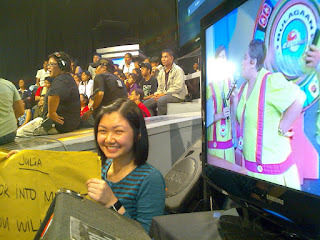 That is my "last-day picture" in Eat Bulaga. I worked as one of their Creative Writers and every day is indeed a learning experience. It's a daily noontime show, so what do you expect? Not sleeping is part of the norms, and so is hideous eyebags. But however tiring life in Eat Bulaga may get, I loved the adrenaline rush, and the sense of fulfillment because of the children I was able to help in Ebest. My work there is over and I'm on to another beautiful chapter of my life, written by my favorite author, God. I am overjoyed. My heart sings of nothing but gladness. My days and weeks are filled with God's grace. And with His blessing, and my parent's blessing, I have already started with the long to-do list before I set foot in Taipei. I actually am thinking of putting up another blog for my Taiwan gig (Niko coined that term) but I am just too lazy to register for another account. This blog will now carry some details on what I am up to and what I have accomplished, because I know for a fact that in the days and the years to come, I would be reading them again and again. So here's to an account of what happens before, during and after Taiwan! I have already received my acceptance letter in the mail and faxed it immediately to the embassy. The requirements are pretty basic, just the Transcript, Diploma, and the completely filled-out Enrollment Registration Form that they mailed together with the letter. The hard part is to have these documents authenticated by CHED and DFA. I went to DLSU's Office of the University Registrar to have my Transcript of Record and Diploma authenticated first by CHED. However, they have set 18 working days before I can get the documents. I was disheartened because I know I wouldn't make it to NCCU's deadline if they have to process it in 18 days, plus 5 days for DFA authentication, and another 5 days for embassy verification. If I wouldn't be able to beat the deadline, which is July 15, the slot would be forfeited, and so is the scholarship. I need all the help I can get. Badly. So with all the courage, I emailed Sir Edwin Santiago, the DLSU Associate Vice Chancellor for Academic Services and University Registrar. And I am so grateful he replied immediately and acted on my urgent concern. The 18 days, I think, would be cut into half. I will forever be thankful to Sir Edwin and to the OUR. My papers are on their way to DFA, if I'm not mistaken. Mom already made me book a flight to Taipei because the airline is having a promo sale. I will be leaving early September to make it to the International Student's orientation. Today, I just had my medical examination which lasted for almost three hours. I don't know what took it so long. But at least, it's done and done. The results of which will be out by Wednesday and I have to fax it to the embassy before June 30. I am hoping and praying that everything will turn out smoothly. There are still lots of things to do like turning over the documents and applying for a Visa and so on. Ang cool nanaman! Mag-aaral ka with scholarship abroad! AMAZING!!! Grabe na yan ah Eat Bulaga then this! Ibang level ka talaga!